Marahni Trek is suitable when you only have a few days for visiting the GHNP and you expect to have a great experience of the place. 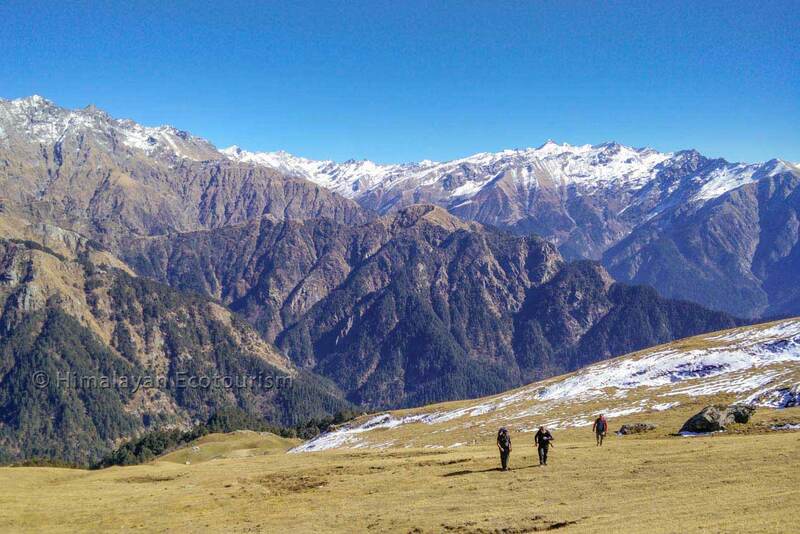 Marahni trek starts at an altitude of 2100 m, much higher than Gushaini, the starting point of Rolla and all other Tirthan valley treks. Hence the total ascent is comparatively less although you reach a maximum altitude of 3670 m at Marahni. 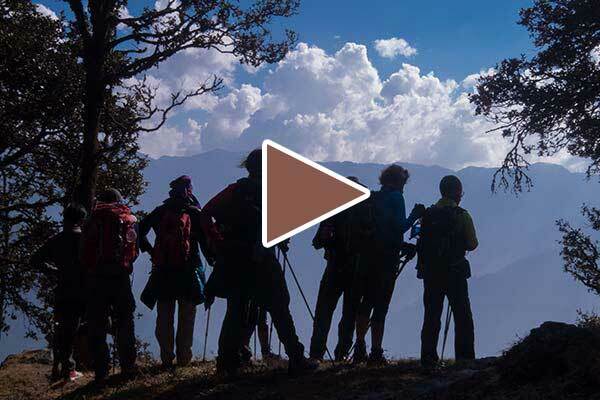 The first day of the Marahni trek is Rangthar which let’s you discover some beautiful Himalayan villages. Then you gradually get in the wilderness of the GHNP going through an oak forest which will give you the feeling of being in a fairy tale. Kundri meadow is located on the way to Marahni. It is a great camping place and it can be used as base camp for further exploration towards Marahni. Marahni in itself could be a camp site in case the weather permits. The view from the top of Marahni is amazing. 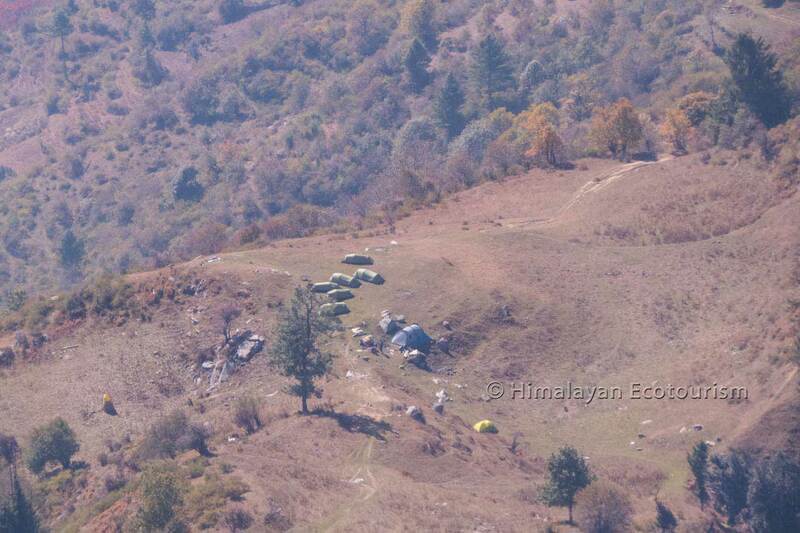 Some mammals can be observed on this trek as well, mostly wild sheeps (Goral) and Black Bears (or even the Brow bear). Feeling too tired on the way to Marahni? no problem, stop at Kundri which is already a very nice destination! There is a lot of flexibility on this trek. On the western side of the Tirthan valley. 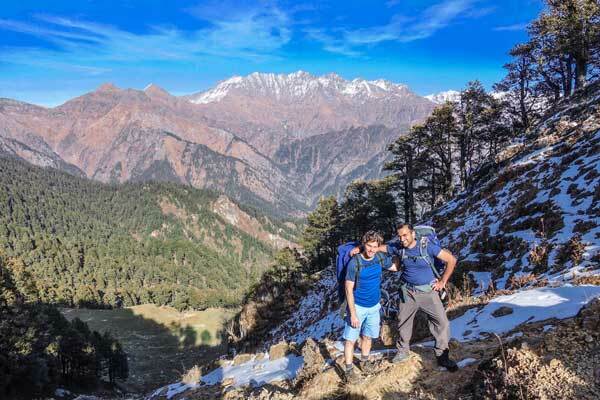 From Day 2 the trek follows a mountain ridge with great view of both sides: Tirthan and Srikot. You need to go to the trek starting point by jeep with your staff and equipment (9 km, 30 minutes). 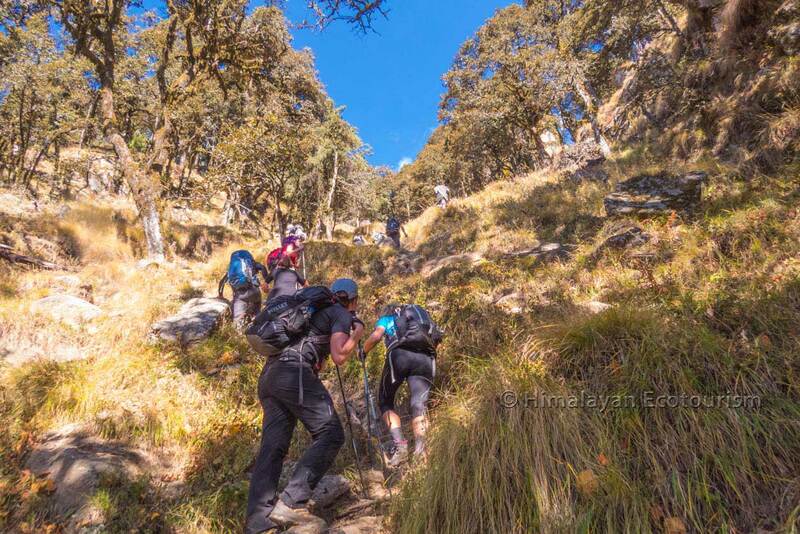 Marahni trek starts at a relatively higher altitude, and so you can enjoy a very scenic peak without having to climb too much. 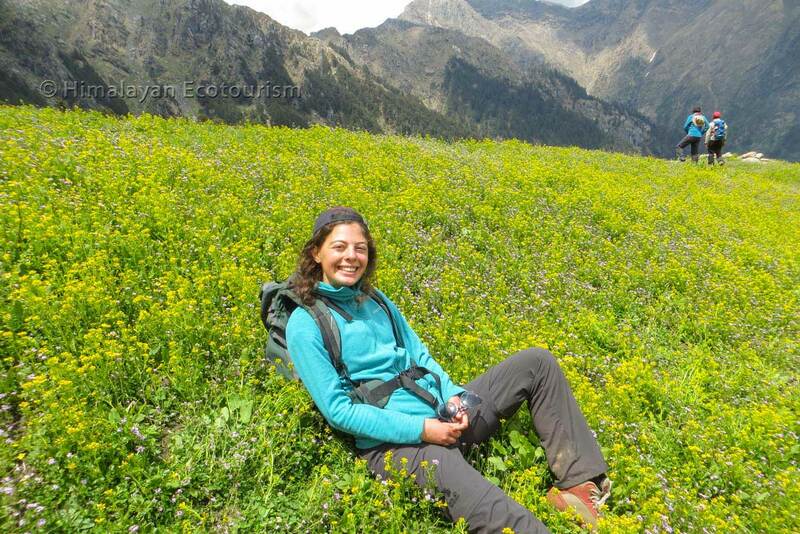 Best time for Marahni trek is April, May, June, and then October and November. 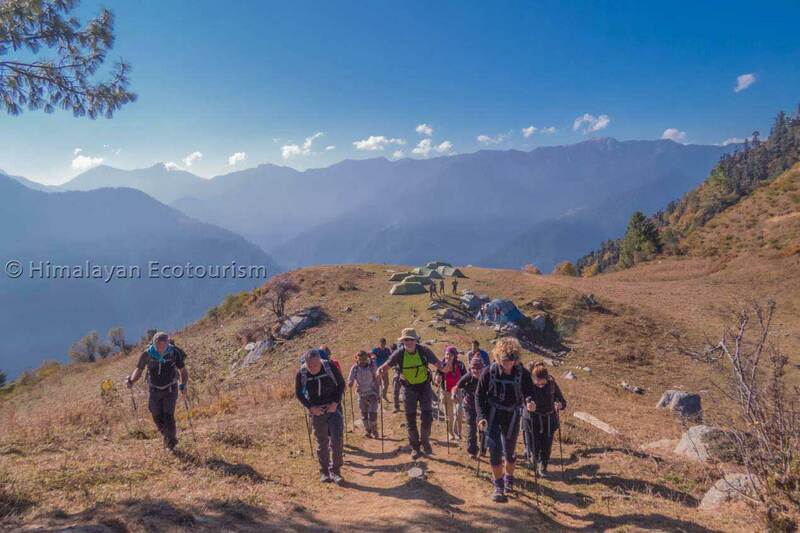 Marahni trek starts from a village in the ecozone of the Great Himalayan National Park called Pekhri accessible by a small road from Gushaini. 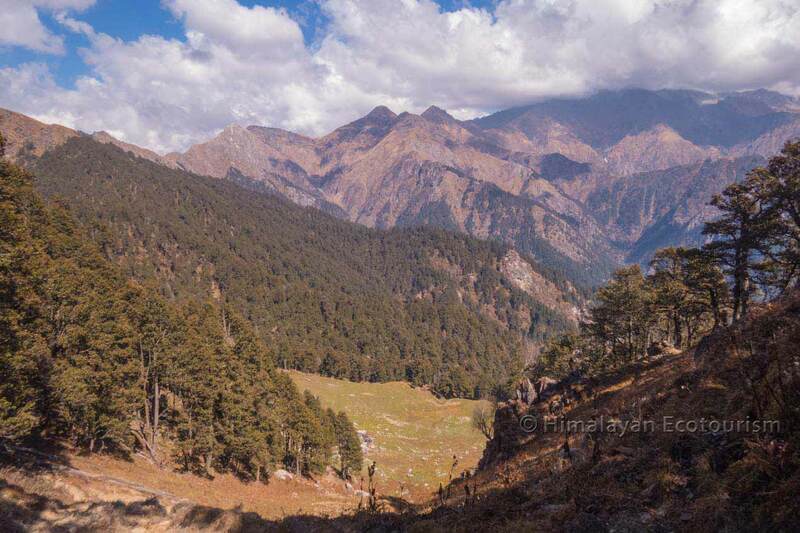 From Pekhri you walk towards Lakcha (two hours), a very charming traditional Himalayan village. Have your packed lunch before Lakcha at a quite scenic spot. After Lakcha you still have at least one hour walk. 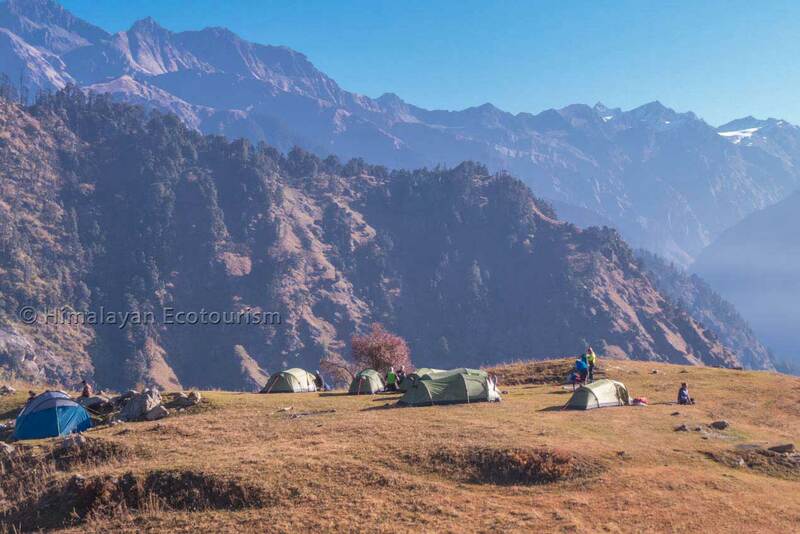 You reach a flat-topped ridge where you will set up your first camp, Ranghthar. 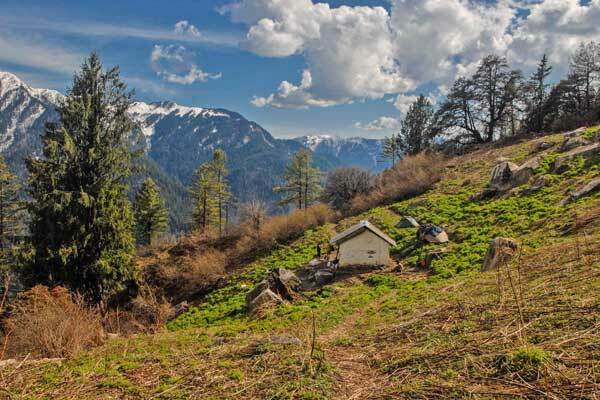 From Ranghthar you have an ideal view of the Himalays and the Tirthan valley. A spectacular spot for camping ! It is really great to enjoy your meal at the bonfire during sunset. The sun rises over the peaks of the GHNP. Don’t miss out on this ! After a copious breakfast everything is packed and you start your second walking day. The first step is Kauni (or Dushmani), a very nice small summit 350 m above Rangthar. 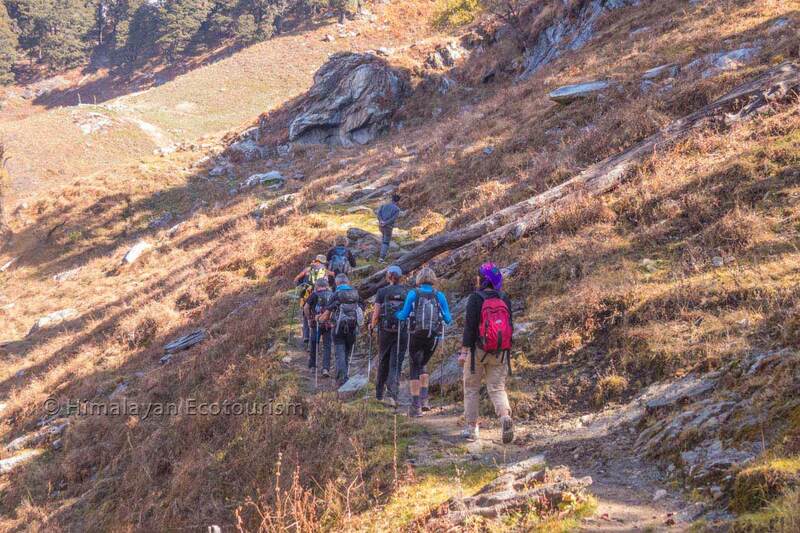 The way to Kauni is the steeper trail of the entire trek. 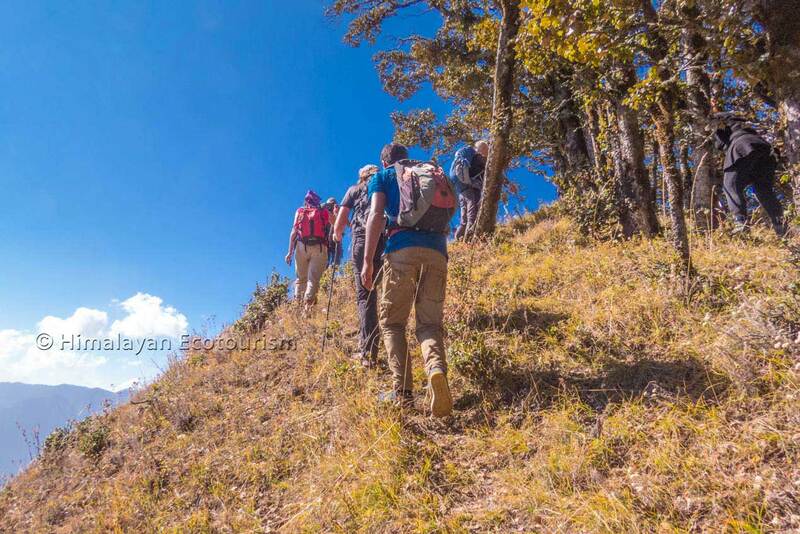 Don’t feel discouraged, it is steep but you will be reaching Kauni very fast and you will be rewarded by the view and the beauty of the forest around. After Kauni it is a very pleasant hike up to Kundri. You go through a golden oak forest that sporadically let you observe the giant Himalayan mountains that appear closer and closer. You have a choice of camp site : Kundri or Marahni. According to the weather, snow conditions, water availability and your physical fitness you decide with your guide where to camp. Both meadows are great for camping. If you reach the Marahni meadow it is worth climbing up to the Marahni top (3670 m) before the sunset to admire the whole valley illuminated with golden sun rays. From your camp have a walk up to Marahni top to Enjoy the spectacular 360° view. 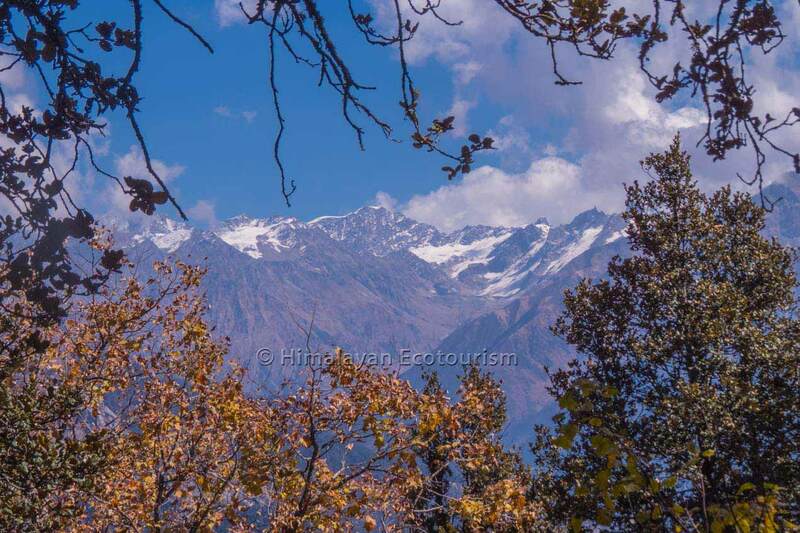 The entire Tirthan valley with its surrounding snow-capped mountains above 5000 m height, one side. The lower green Himalayas and even the plains of Punjab on the other side. If you never reached a high peak in your life you will never forget the pleasure of reaching Marahni ! After enjoying the scenery your guide will take you around to spot wildlife. Many kind of species of Eagles and Vultures will represent the bird life. Wild goats, Himalayan Tahr, black bear and the common leopard can be observed around Marahni. Be patient the mammals are quite elusive. Tonight you have your dinner and your night at the same place than yesterday. That will give time to your cook to prepare a special dinner ! 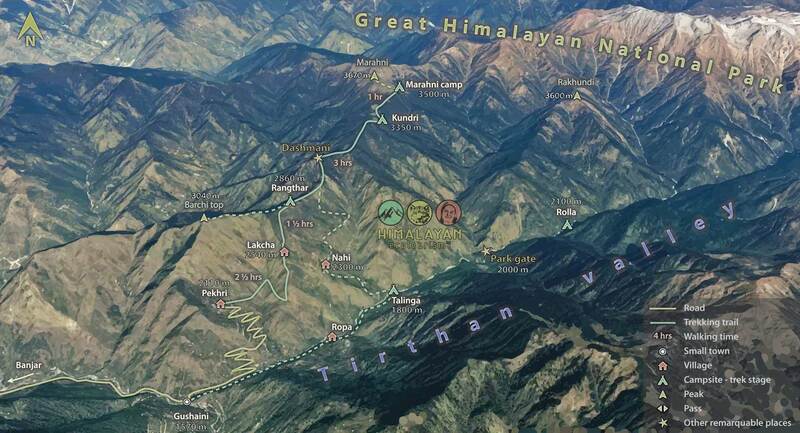 Today you will get down to the Tirthan river in the ecozone of the GHNP crossing some villages (without any roads of course). It is a long descent but you will have time to stop in the villages and observe the peaceful lifestyle of the Himalayan people. Very refreshing for the mind ! In the evening you will set up your camp at the riverside. You are now at only 1800 m. The vegetation is very different, many birds can be observed. Enjoy the sound of the river and spend your last night in the wilderness. Take you time to enjoy the riverside. Today you have only two hours of walk. You could take photographs of birds or spent more time interacting with the villagers on the way. Or just have a lazy time by the riverside before leaving and hiking to Gushaini, last stage of the trek. Walk down to Gushaini after your lunch. The trek in 4 days is not a loop. It is a return trip from Pekhri to Marahni. 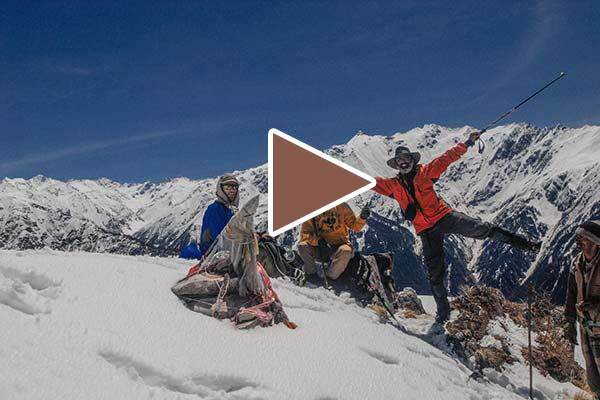 Day 3 Exploration day at Marahni and camp at Kundri. You can use this day for photography and observation of wildlife. Day 4 From Kundri to Pekhri. You have less time? Try Marahni in 3 days. Day 2 From Rangthar to Marhani. You can decide to camp either at Kundri or at Rangthar. 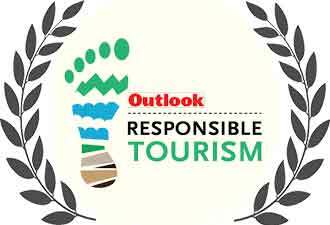 If you are not sure about your physical capacity opt for keeping your basecamp at Rangthar. The first night is spent at the Rangthar meadow. 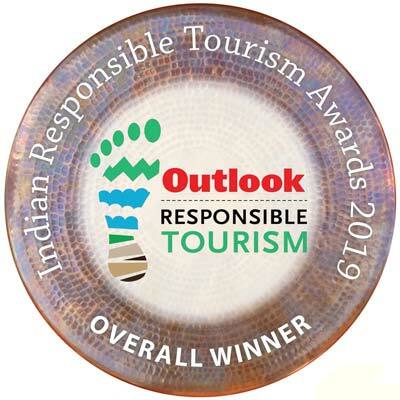 On this day you will gradually approach the real wild of the Great Himalayan National Park. 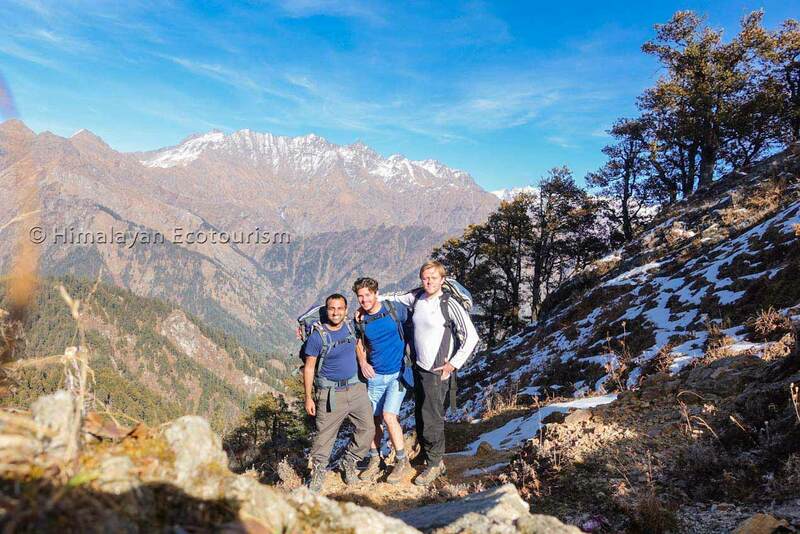 After the climb you are rewarded with a great view of the Tirthan valley. Have a break ! This is how your Rangthar camp looks like from Kauni. You will really enjoy your time after Kauni as you go through meadows and forests. 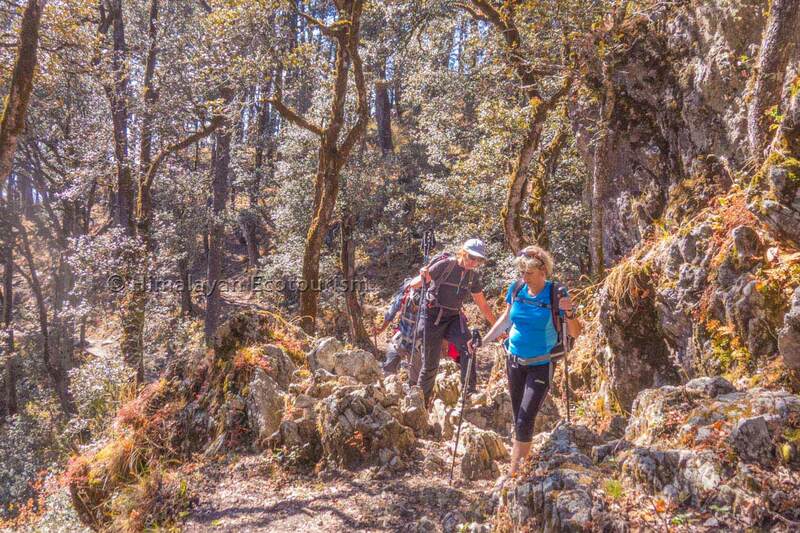 While hiking to Kundri the forest sporadically offers you great views in between 2 oaks. The ecosystem is dominated by the Golden Oaks which create a very special atmosphere. 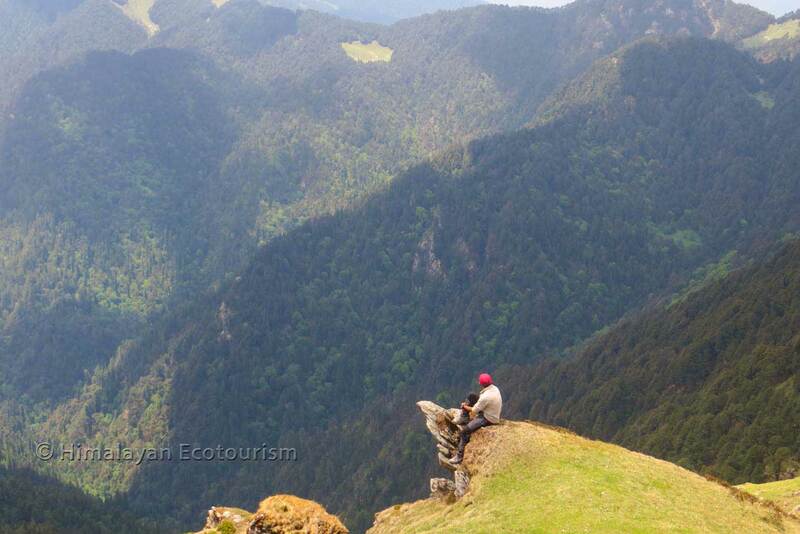 You reach Kundri from above and so you initially enjoy the view of the meadow. 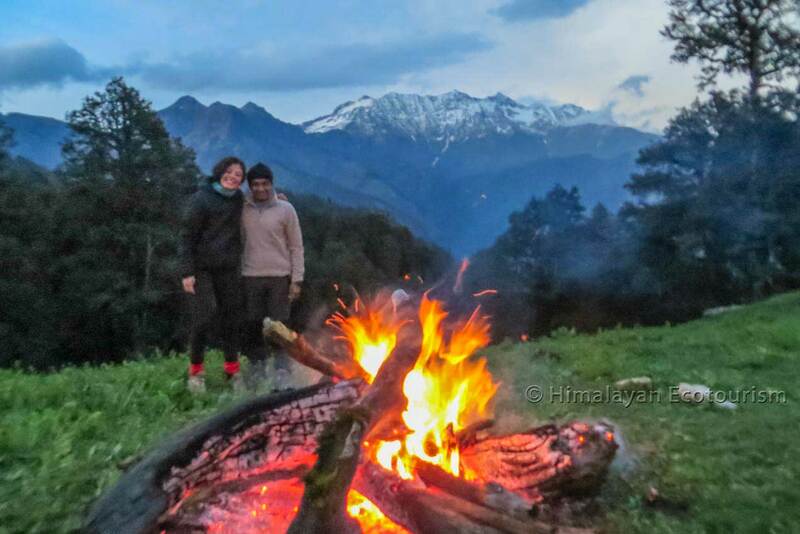 Enjoy the bonfire at Kundri which is at an elevation of 3400 m.
Climbing towards Marahni from Kundri. You may have some snow on the way. It is very exciting to approach Marahni as the view opens and the summit calls. Looking towards the South you have a great feeling being above so much of forests. Marahni trek ? In less time, you enjoy a lot of the wilderness. In case of a 5 day trek you can enjoy the riverside for the last camp and day.